Murder by Darkness: Does Mammoth Cave’s Specter Harbor a Secret? Partisan protests put public trust in scientists at risk. Can Anything Save Us fromUnintended Consequences? Ben Radford explains a strange mist found in a Phoenix woman’s driveway. 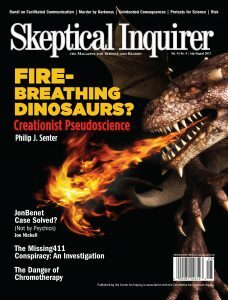 To support their claim that humans and dinosaurs coexisted, numerous antievolution publications—including grade-school science textbooks—assert that dragon legends were inspired by human encounters with fire-breathing dinosaurs. Here’s why that’s unrealistic. Newly obtained recordings provide a unique opportunity to assess the sessions of a genuine “psychic detective” police case. In his “Missing411” series of books, author David Paulides claims that people are going missing from U.S. national parks under unusual circumstances and the National Park Service is obstructing attempts to investigate. What are the facts? Geoffrey Kabat debunks elusive health risks in his new book. Robert Sheaffer is one of the—if not the—world’s top experts on the subject of unidentified flying objects and claims of extraterrestrials, and he shares that knowledge in his new book Bad UFOs.